The UFT Boiler is a medium mass high efficiency boiler. This advanced modulating gas condensing boiler has a 316L stainless steel fire tube heat exchanger with a 96% AFUE rating. It also has ultra-low NOx emissions, making the UFT eco-friendly and your best option in today's green market. It is available in both a wall mounted version and a floor standing version. The UFT Boiler has been rated one of the Most Efficient Boilers by ENERGY STAR for 3 years in a row! HTP's high efficiency residential boilers save energy, money, and protect the environment. While traditional boilers are not able to modulate, high efficiency boilers modulate which allows the boiler to run longer and at lower fire rates while maintaining the desired temperate in your home. This improves efficiency and saves energy. The UFT puts everything you love about HTP’s focus on high efficiency in this versatile boiler. It is compliant with the NOx emissions limit set forth in SCAQMD Rule 1146.2. resulting in an eco-friendly boiler. The UFT is ETL listed and exceeds the latest minimum efficiency requirements of ASHRAE 103 with an AFUE rating of up to 96%. If just 1 in 10 households used ENERGY STAR certified heating equipment, we would prevent annual greenhouse gas emissions of 12 billion pounds! The UFT Boiler is available in six different models ranging from 80,000 to 199,000 BTUs in both wall and floor standing units. It is suitable for any residential application in both natural gas and liquid propane. It can be used in radiant flooring, with fan coils, base boards, snow melt, and domestic hot water (with indirect tank) or pool heating (with indirect tank). The UFT Boiler is also a wonderful option for new construction and retro fitting. When ordering, replace * in model number with W for Wall or F for Floor units. The UFT Boiler's Combustion System is equipped with a specialized mixer on the inlet of the blower to increase boiler turndown to a 10 to 1. Modulating technology matches fuel consumption to demand to provide high system efficiency even during low load conditions. Greater turndown allows the UFT Boiler to modulate at lower firing rates which reduces short cycling, conserves energy and improves component reliability. The Digital Control System with back lit design assists in detecting faults and maintenance intervals and also highlights the master boiler in cascade operation with multiple boilers. 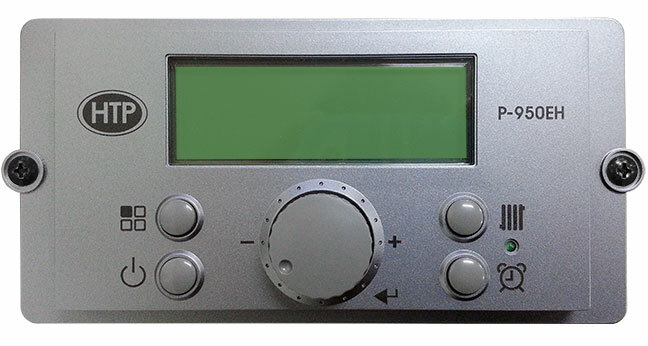 If digital control system senses a problem the display will show a fault code and narrative to aid in troubleshooting. It can also be used to view and adjust temperatures. 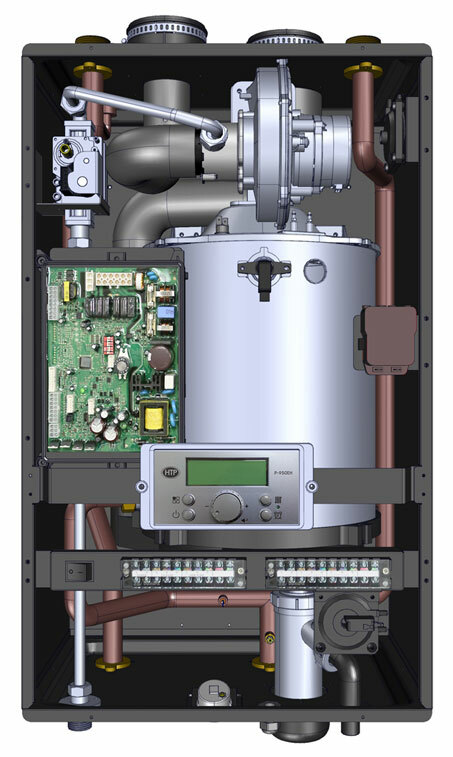 The UFT Boiler features top and bottom supply and return connections on every unit. This allows for greater installation options. No primary/secondary piping is needed. The boiler vents in inexpensive, easy to install PVC, CPVC or Polypropylene piping. It also an overall vent length of 100' in 3" pipe or 50' in 2" pipe. An extremely durable laser welded 316L stainless steel heat exchanger features high temperature aluminum fins that are inserted into the individual fire tube circuits to increase heat transfer capabilities and resists corrosion. Its unique downward fire tube design provides optimal condensation drainage and produces self-cleaning for low maintenance. The compact storage size of the unit allows for low pressure drop and higher efficiency. It's equipped with an outdoor sensor that adjusts the UFT's set point to match seasonal conditions which improves the overall operating efficiency. The UFT Boiler is backed by a limited 10 year residential warranty out of the box! No registration is required.